Curry is a common dish in Japan. The British introduced the ingredients to Japan in Meiji era (1868-1912), at the time when India was under British colonial rule. India is of course, the home nation of curry. 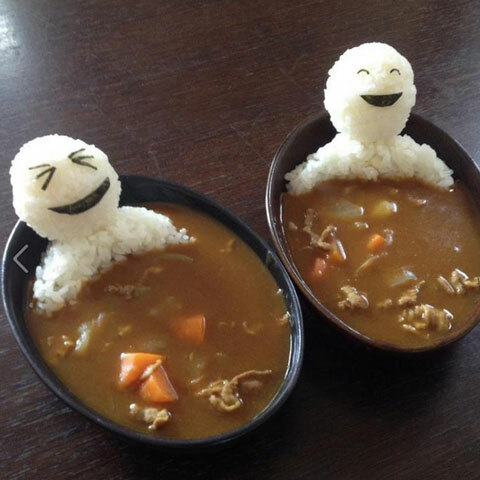 Over the years Japanese improvise the taste and their curry becomes a national dish with its own distinctive flavour. Curry features more often in daily meals than sushi or tempura etc. The later two are probably more iconic from foreigners’ point of view though. One of the factors of its popularity is that people can make it easily with packages from convenient stores. Just heat up the pack and add in some veges and meats, and it’s edible in a few minutes. A Japanese food video. It’s about sushi, tempura, and also some history of the Tokyo seafood markets and traditional dining culture. BTW, unlike conveyor belt sushi, dining at one of those traditional restaurants can cost quite a bit. It’s not an everyday food for common people. Before getting to more anime stuff, here’s an official Japan tourism video instead, which features Yamanashi, the “home” of the famous Mount Fuji. Yamanashi Prefecture is a popular destination for its natural scenery and cultural sights. It’s close to Tokyo and easily accessible by road or rail. Besides being the gateway to Mt Fuji, Yamanashi is also famous for Buddhist temples, hot springs and national parks etc. Tokyo has built a full scale Gundam figure to celebrate the 30th anniversary of the epic mecha anime series. The first Gundam series, aka Mobile Suit Gundam, aired in Japan in April 1979 to January 1980. It’s the beginning of a media franchise with multiple sequels, spin-offs, movies and also video games. In addition it’s also the start of the popular Gunpla figure collections. In 2008 Gunpla makes up 90 percent of the Japanese character plastic-model market. Besides its own legacy Gundam also inspired many other modern mecha anime series. It’s the grandfather of the genre, they will probably set up a museum for it someday. Update: Although it’s not entirely Gundam themed, the franchise is the highlight of the Bandai Museum in Tochigi. The museum also features exhibits from Ultraman and Godzilla etc.